Global climate change is one of the most pressing issues our world faces. More greenhouse gases are in our atmosphere today than ever and agriculture is one of the leading contributors. In fact, 1 cow has 25 times the global warming impact of your car! At the root of this problem is poor land management and grazing habits. When livestock are kept in one spot they degrade the land, prevent forage from growing properly, require more water, and increase chemical runoff. Livestock also emit methane and nitrous oxide while preventing carbon from naturally being cycled back into the earth. Raising livestock doesn't have to be bad for the environment, in fact, it can actually be used to mitigate climate change when done properly. Scientists and farmers have discovered a land management technique called rotational grazing that can be used to revolutionize sustainable farming. Rotational grazing is the practice of moving livestock between segmented land. Only one portion of pasture is grazed at a time while the remainder rests. 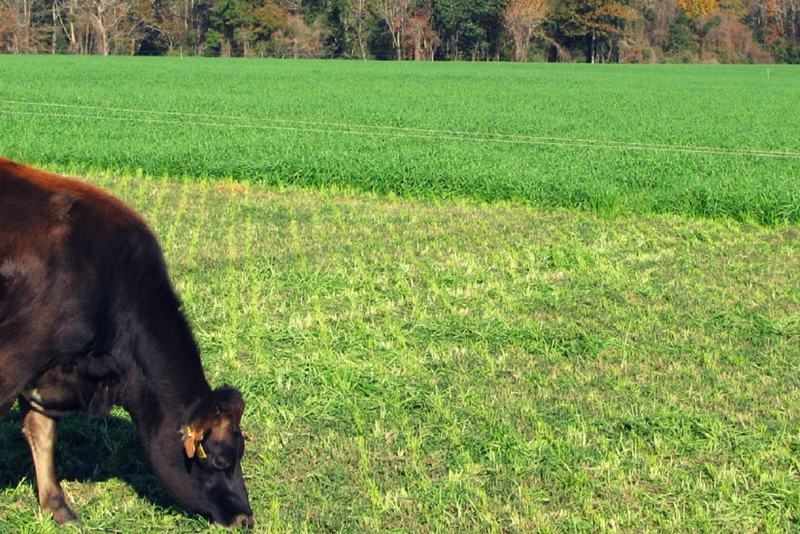 Resting the land improves long-term pasture quality, forage nutrient density, and forage fertility, by favoring desirable pasture species and allowing for even manure distribution. Rotational grazing dramatically decreases soil erosion potential and increases the amount of carbon stored in the soil. When done correctly rotational grazing can help sequester carbon. It also aids in saving water and improving water quality. More soil and denser forage means less pesticides and fertilizers needed to maintain the land and as a result less toxic barnyard runoff. Animals in rotational grazing systems have more space and fresh air which reduces their exposure to high levels of microorganisms and gives them access to a healthier diet. More freedom allows for an increase in movement which enhances physical fitness and decreases opportunity for injuries. Together these factors create a healthier, happier, more profitable herd. "Most farmers try rotational grazing because of the economic savings. In Wisconsin, graziers averaged about $200 more per cow net farm income than confinement dairy farms according to farm financial data collected from 1995 to 1999 according to University of Wisconsin Center for Dairy Profitability. During the same period, graziers averaged more than $1.50 higher net farm income per hundredweight equivalent of milk sold than achieved by confinement dairies. Beef, sheep, and dairy heifer growing operations have also seen reduced costs and increased profit from rotational grazing systems." To learn more about rotational grazing and it's other benefits check out Pastures for Profits Guide to Rotational Grazing and The Savory Institute. So why aren't all farmers practicing rotational grazing? Not all farmers are practicing rotational grazing because it requires moving their fencing every day and old school electric fencing hasn’t changed in 60 years. This primitive technology breaks on average every year and a half and is hard to use. The average farmer spends 14 hours a week setting up their fence, walking the perimeter to make sure it’s working, and walking back and forth to their energizer to turn it on and off when they want to make adjustments. And once they get it set up, it’s unreliable. The system will short and they won’t have any idea where or when. This leads to more hours spent searching for missing livestock that got out and in some situations loss of an asset. At Drovr we believe farmers should be able to practice rotational grazing with ease while also keeping their livestock protected. That’s why we’re developing the smart fence. The first solar powered electric fence energizer that can communicate with a phone. Drovr can detect the moment something is interfering with a fence causing it to short. And best of all it can be used with a farmers existing equipment. So in just 10 minutes they can replace their old energizer with ours and unlock notifications over a cellular network. Instantly knowing where and when their fence is shorting allows them to fix it faster. Saves them hours of time searching for their animals. And assures them that their most valuable assets are right where they’re supposed to be. On top of that we’ve added remote control. So when they’re moving their fence or making adjustments they don’t have to walk back and forth to their energizer anymore. Saving them 14 hours in set up each week. By making more efficient technology Drovr is making rotational grazing easier and farming more sustainable around the world.